There are only a few things that provide respite in the scorching Delhi heat, and, for us (and many of you, we’re sure), swimming happens to be one of the best. Now, if you aren’t a club member, it’s difficult to locate places where you can swim at a per-day cost, or perhaps a temporary membership that won’t burn a hole in your pocket. We’ve got you covered. Located close to most of the places in Delhi (except Dwarka), Friends Swimming Academy provides a huge, professional-sized swimming pool to city-dwellers. 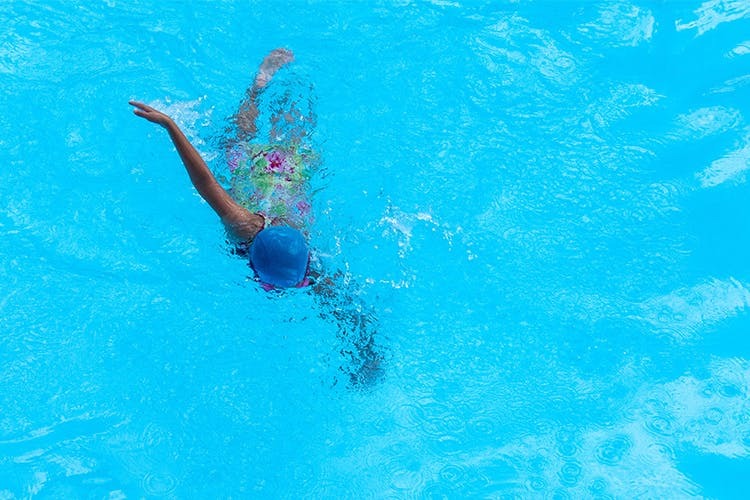 Just go show-off you swimming moves or attain some new ones with hands-on, on-the-spot coaching available at the pool. It’s closed on Thursdays, however, so we hope that isn’t coincidentally the day you plan to check it out on. Their season is on from April to December, and they offer swimming at a cost per day, as well as a month, three month and six month membership. The pool is 30ft by 60ft, and the deepest end is 8ft. Coaching is also offered. Price: INR 275 per hour; INR 4,500 (1 month); INR 9,500 (3 months) and INR 13,500 (6 months). Coaching comes for INR 3,000 a month. One of the oldest spots to swim in town, with an Olympic-sized pool at that, they let you swim after you pass a basic test. Their rates differ according to age, and you’ll have to request coaching, but they only train people who already know the basics of swimming. You have to acquire a temporary membership here to avail of their swimming pool, as well as other facilities. The cost isn’t too exorbitant, and they offer coaches as well—in case you’re looking to learn. They allow outsiders (non-guests) to swim at a fee. There are a variety of time periods your can opt for (per day, 2 months, 3 months and an annual deal), and depending on which you pick, they offer deals on the use of their spa and wet area. This one is the most popular on the list, also making it the toughest to get access to. You can swim here, but only after you apply for a temporary three-month membership, and pay an additional cost each month. The forms come out on the last Monday of every month, and the demand is huge, so you’ll have to hop to it. That aside, their facilities are excellent, ergo the popularity. Open Tuesday through Sunday, you can head to Chilla for a dip between 6am-10am, and 3pm-9pm. While Chilla is open to all, you can opt for a temporary membership for the summer. If you choose to go in the morning, you can catch a spectacular view of the sunrise. The pool’s open till end September. Coaching classes are available at an extra INR 800 per month. Just a few steps away from LSR College lies Pacific Sports Complex, with a large eight-lane pool. Although it may intimidate you with its Olympian look, they also cater to beginners, and offer coaching classes at an extra INR 1,500 per month. This small, neighbourhood club usually attracts residents only, but come April, and we see people driving in from all parts of the city, courtesy the swimming pool. The pool is fairly small, with the deepest end being just 6 feet, but it’s clean and hygienic. This academy boasts of a large pool and pays homage to sports hero Khazan Singh. A training ground for both beginners and seasoned swimmers, the pool is clean, equipped with efficient staff, and lives up to international standards. They have coaching for any and all newbies. While the school is shut during summer holidays (and any other extended period of holidays), their pool is open for public use. They have hygienic facilities, and make sure everything is kept in tip-top shape. It’s one of the oldest swimming spots in the city. If you can gather a group of 10 or more, they’ll provide coaching, but you won’t find any one-on-one lessons here. As per one of our reader’s suggestion, the HUDA Gymkhana Club is a stellar option as it is very clean and well-maintained. The pool is half the the size of an Olympic pool and monthly membership starts at a mere INR 2,000 (plus taxes). They have a splash pool too, for the little ones. Note: Watch this space, we’ll keep updating this through the summer.